I’ve taken a fair amount of flack for my call to recall Columbia (MO) First Ward City Councilwoman Ginny Chadwick, including from dinosaur prohibitionist Don Stamper, who labeled me and my associates “an embarrassment to community leadership”. Yet neither Ginny Chadwick nor Don Stamper, nor anyone remaining in the (small) coalition of people who still stand behind Chadwick’s leadership ventured a single response to my core argument in favor of making the marijuana cultivation laws less punitive: that making it easier for Columbians to engage in small-scale home cultivation of marijuana will decrease the total number of interactions between marijuana users and marijuana dealers in black-market transactions, leading to modest decreases in black market violence and fewer bodies on the street for Chief Burton’s officers to find. While my particular angst with Chadwick’s leadership is rooted in her flip-flop on marijuana policy, the same fundamental economic logic applies to Chadwick’s other major policy initiative: her proposal to ban cigarette and e-cigarette sales to people under 21 years of age (and additionally to ban the use of e-cigarettes in indoor spaces). This policy, while restricting access, does nothing to decrease demand, and therein lies its fatal flaw: Some black or gray market vendor, likely acting outside of any legal or regulatory process, will inevitably emerge to meet the demand for tobacco products in Columbia from the 18 to 21 year old demographics. This inevitability brings with it two distinct externalities: first, the very real prospect that black market tobacco vendors will seek to maximize profits by selling product to minors (the market of 18 to 21 year old consumers is not as large as the market of 12 to 21 year old consumers) and the substantial likelihood that black market profits will drive black market violence, as dealers seek to maximize and protect their turf. Instead of regulated, licensed vendors selling regulated products to adults, black market dealers will capture that market, selling product to anyone who has the cash. And these dealers won’t just carry tobacco products: to maximize profits, they’ll also transact illegal pharmaceuticals and other hard drugs. In other words, Chadwick’s policy of tobacco and marijuana prohibition will act as an open invitation to violent foreign cartels like Sinaloa, who are very sophisticated about finding and developing new markets. In Ginny Chadwick’s Columbia, tobacco prohibition is the gateway to this future. We’ve walked down this road of failure for a long time. Alcohol prohibition gave rise to immensely powerful cartel gangs, at least until 1933, when Americans realized the utter failure of that policy. And 40+ years of the War on Drugs has created essentially the same horrors as foreign cartels ravage Central and South America and violate American borders. America now leads the world in incarceration of our citizens and we pump tens of billions of dollars every year into narcotics enforcement with nothing positive to show from a public policy standpoint. In recalling Ginny Chadwick, we have an opportunity to move in a more sensible direction. We don’t have to resign ourselves to more violence and more economically-driven challenges to our social and governmental structures. We don’t have to resign ourselves to more bodies on the street. Our law enforcement has much better things to do than arrest people for marijuana cultivation or tobacco use. The First Ward, which has seen the brunt of racially divisive politicking, needs leadership that respects citizens as citizens and does not attempt to subsume our American rights under the morass of failed prohibition. It’s time to recall Ginny Chadwick (and demonstrate to prohibitionist dinosaurs like Don Stamper that he’s on the wrong side of history). (Thomas Benton at the time was serving as Missouri’s other Democratic US Senator). Preston’s single most important fact? The officers “began recording their interaction with Preston within ‘one or two minutes’ of approaching him.” Id. at *2, *9. Without that recording, the Court would have never known the extent of the coercion in the case – this mentally-disabled kid would have lost a swearing match with the police in an evidentiary hearing. This is a second time in only a month that the recording of a confession gave the Ninth the true facts of the case – and revealed the real abuses that go on with interrogations. See blog on Ramirez-Estrada, here . This is a careful, nuanced decision that relies heavily on the precise words used during the booking process. Id. at *5. How can Judge Clifton quote this exchange verbatim? “A recording of the interview, from which we can draw precise quotations, is part of the record.”Id. at *5 & n.3. Would this constitutional violation have been discovered, if the record was merely a swearing match between the agents and the defendant? Ramirez-Estrada illustrates the travesty of federal agents refusing to tape interviews – the only reason not to record is to hide violations like the Doyle problem in this case. St. Louis Juvenile Court Presiding Judge David C. Mason says while the nation is getting soft on marijuana, he sees it as a contributing factor to crime. Mason believes that pot may be fueling juvenile crime such as break-ins, robbery, and auto theft. “And I can tell you right now, I can’t think of the last juvenile offender I had in front of me that didn’t have a marijuana-use problem,” Mason says. Mason says that academic failure makes crime seem appealing to juveniles. He adds that 90 percent of the offenders he has seen have no father in the home. “There’s something about the impact of effective fatherhood, which makes a huge difference in the outcomes in terms of the behavior of young people,” Mason says. He hopes that as a nation we do not open the floodgates to something that we are really not expected. He warns for everyone to be careful as we proceed in the direction of legalizing marijuana. “The impact on children is obvious, it’s quantifiable and I see it every day at my job,” Mason says. Yet in the Missouri Bar’s 2010 Judicial Evaluations, in which lay people and hundreds of lawyers filled out surveys, Mason was the only 22nd Circuit judge of ten to receive a failing grade in one of eighteen categories (specifically, he was below the baseline in being “prepared for hearings and trials”). Nevertheless, the Missouri Bar recommended his retention. The Justice Department announced today that it has opened a pattern or practice investigation of the Family Court of St. Louis. The investigation will focus on whether the court provides constitutionally required due process to all children appearing for delinquency proceedings and whether the court’s administration of juvenile justice provides equal protection to all children regardless of race. Despite an unusual state law requiring judges to consider racial disparity when deciding whether to try juveniles as adults, Missouri prosecutes a disproportionate number of black youth accused of serious crimes in regular courts, where they can be sentenced to prison alongside hardened criminals. In recent years, African-American teenagers have faced trials in adult courts at a rate three to four times higher than their proportion of Missouri’s youth population. They were defendants in 57 percent of such prosecutions in 2008, the latest year statistics are available, even though they make up only 14 percent of state residents between ages 12 and 17. In other words, the necessary context for Judge Mason’s defense of marijuana prohibition is that he is a criminally incompetent judge who perpetuates a horribly racist juvenile justice system. Does anyone not on Mason’s docket in St. Louis take this guy seriously? While I don’t agree with St. Louis attorney Rory Ellinger on everything, I am very grateful for his open and prominent voice in the Missouri legislature on behalf of criminal justice and drug policy reform. Indeed, Ellinger should be widely commended for his work in those fields during his freshman term as a Missouri Representative, and for particularly championing marijuana legalization. It is rare for a politician to break with the party and government establishment on such issues, and Rep. Ellinger should be commended for his leadership. If you are a supporter of sensible drug policy reform and marijuana legalization in Missouri, you should support Rep. Ellinger’s campaign as a way to demonstrate to other politicians that it’s time to end prohibition. Even a modest donation will inform the political strategists at the Missouri Republican and Democrat parties that it’s time to take marijuana and drug policy reform seriously. Missouri’s Sunshine Law has been a great boon to citizens engaged in the basic democratic process of understanding what their government is doing. Yet, Missouri’s Sunshine Law still acts under the presumptions that information is not released without a request and that citizens must often bear a cost for the access to that information. Citizens additionally face the dilemma of not knowing with specificity the extent of government records available, impeding their ability to find the records they need. Hence, the costs of monitoring government under the Sunshine Law effectively price most citizens out of access to basic information about the conduct of government. In other words, Missouri government entities have a legal duty to maintain and archive records of their activities, but not to provide open public access. Rather than making it costly for citizens to search for and acquire public records, the law should mandate all public records be posted to an online archive, in as close to real time as possible. Since public records are already archived by statute, this law would only need to mandate the electronic publication of archive material. This proposal would end fundamental barriers to citizen access of government records. Citizens would no longer be in the dark about the existence of any specific government record, and would have complete information about the entire corpus of government records. Additionally, ending fee-only access to government records would remove a cost incentive for citizens to rationally ignore the political process; on some margin we can expect this proposal to energize grass-roots political education and activism. This legislation should be enacted through a ballot initiative campaign to amend the Missouri Constitution. Please contact me at Eapen.Thampy@gmail.com if you would like to discuss the prospects for enacting some version of this proposal in the 2016 election cycle. “Our constitution does not copy the laws of neighbouring states; we are rather a pattern to others than imitators ourselves. Its administration favours the many instead of the few; this is why it is called a democracy. If we look to the laws, they afford equal justice to all in their private differences; if no social standing, advancement in public life falls to reputation for capacity, class considerations not being allowed to interfere with merit; nor again does poverty bar the way, if a man is able to serve the state, he is not hindered by the obscurity of his condition. The freedom which we enjoy in our government extends also to our ordinary life. There, far from exercising a jealous surveillance over each other, we do not feel called upon to be angry with our neighbour for doing what he likes, or even to indulge in those injurious looks which cannot fail to be offensive, although they inflict no positive penalty. But all this ease in our private relations does not make us lawless as citizens. Against this fear is our chief safeguard, teaching us to obey the magistrates and the laws, particularly such as regard the protection of the injured, whether they are actually on the statute book, or belong to that code which, although unwritten, yet cannot be broken without acknowledged disgrace. “Nor are these the only points in which our city is worthy of admiration. We cultivate refinement without extravagance and knowledge without effeminacy; wealth we employ more for use than for show, and place the real disgrace of poverty not in owning to the fact but in declining the struggle against it. Our public men have, besides politics, their private affairs to attend to, and our ordinary citizens, though occupied with the pursuits of industry, are still fair judges of public matters; for, unlike any other nation, regarding him who takes no part in these duties not as unambitious but as useless, we Athenians are able to judge at all events if we cannot originate, and, instead of looking on discussion as a stumbling-block in the way of action, we think it an indispensable preliminary to any wise action at all. Again, in our enterprises we present the singular spectacle of daring and deliberation, each carried to its highest point, and both united in the same persons; although usually decision is the fruit of ignorance, hesitation of reflection. But the palm of courage will surely be adjudged most justly to those, who best know the difference between hardship and pleasure and yet are never tempted to shrink from danger. In generosity we are equally singular, acquiring our friends by conferring, not by receiving, favours. Yet, of course, the doer of the favour is the firmer friend of the two, in order by continued kindness to keep the recipient in his debt; while the debtor feels less keenly from the very consciousness that the return he makes will be a payment, not a free gift. And it is only the Athenians, who, fearless of consequences, confer their benefits not from calculations of expediency, but in the confidence of liberality. But Sabet only uses one part of the paragraph, which takes Mill’s meaning out of context. Sabet’s logic is flawed. Mill, in writing On Liberty, focused on how government wields power to exert their will on an individual. He followed in the tradition of political theorists who tried to define the proper role of government and its effect on personal liberties. Mill’s belief that the state can only restrict an individual’s liberty if it actually harms another is accurate, but what is missing from Sabet’s analysis is this: Sabet links marijuana use, instead of choices and actions by an individual, with why marijuana should remain in the realm of the criminal justice system. Mill believed the mere potential for harm to others is not a valid reason for social control. The harm must be manifested into action that violates our responsibilities and obligations to society prior to government intervention. He famously used alcohol and opium prohibition as examples and defined the need for intervention only when there was a distinct breach of the law. Diane makes an important distinction here that I want to flesh out a little further. Potential for harm can’t be a valid reason for social control because there is no limiting principle that we can sensibly apply; in other words, if we are going to say that we will use the power of government to control behavior when there is a potential for harm then there is no limit to the kinds or types of behavior that can be controlled. This is a totalitarian vision; at its logical extreme it says that there is no behavior that cannot be regulated or controlled in the face of omnipresent potential for harm. Sabet’s world, thus, is one where individual liberty cannot exist. Indeed, this is the focal point of Sabet’s career: to justify the totalitarianism of drug prohibition. 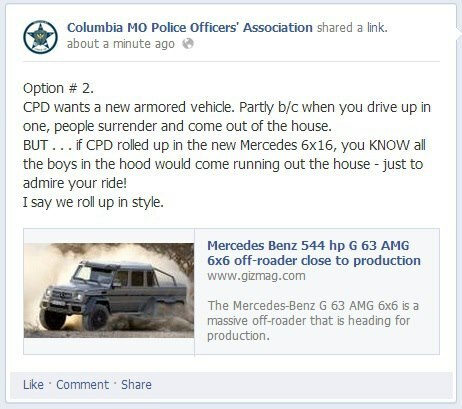 It needs to be said that the language and the mentality demonstrated by the officers of the Columbia, Missouri Police Officers Union are racist and utterly inappropriate for people who have sworn an oath to the US Constitution and are pledged to protect and serve the citizens of Columbia, Missouri. Kathie Kane-Willis, director of the Illinois Consortium on Drug Policy at Roosevelt University, in Chicago, studies addiction-related legislation. Illinois adopted its good Samaritan drug law in 2009. “We know from research that the biggest fear for calling 911 was fear of police involvement,” she explained. McCulloch said he generally opposes granting immunity in any case, but he is open to exploring the legislation. Missouri’s proposal, based on the Illinois model, is sponsored by Rep. Bryan Spencer, a Republican who represents parts of St. Charles and Warren counties. He did not return a call seeking comment. Some states, including Illinois, allow doctors to provide a prescription to addicts, or those who are close to them, for naloxone. The injectable drug, commonly known by the trademark name Narcan, can quickly reverse life-threatening effects of an opiate overdose. The prescription option is not included in the Missouri proposal. Excerpted from Christine Byars, “Proposed Missouri law aimed at saving lives after drug overdoses“, Stltoday.com, 05 March 2013. Though I would like to see the issue of naxalone access addressed, HB 296 sounds like a great start. Good Samaritan Policies have been proven to be effective at saving lives. A 2006 study in the International Journal of Drug Policy found that emergency calls increased after Cornell University’s Good Samaritan Policy was enacted in 2002, although alcohol abuse rates have remained relatively constant. Good Samaritan Policies are not a violation of federal law. The Drug-Free Schools and Communities Act explicitly states that “a disciplinary sanction may include the completion of an appropriate rehabilitation program.” Follow-up evaluations and counseling are fundamental components of any Good Samaritan Policy. The key is that these followups be nonpunitive so that they don’t serve as a deterrent to calling for help. Good Samaritan Policies shouldn’t be viewed as “get out of jail free cards” or rewards for binge drinking. Rather, they provide students with the clarity they need in order to make responsible, life-saving decisions during confusing and stressful party situations. Every minute spent worrying about judicial consequences is another minute it will take for help to arrive. That minute can very literally be the difference between life and death. Campus administrators are correct in wanting to send the right message. And a Good Samaritan Policy would send the message that campus officials care more about keeping students alive than punishing them. A message against the dangers of binge drinking or drug abuse should never have to come in the form of a student’s obituary. More than half of the schools with Good Samaritan Policies provide coverage for situations involving all drugs, not just alcohol. This is logical, since marijuana is often involved in party situations and can serve as a deterrent to calling for help, whether or not the drug was involved in the overdose. We should also remember that the abuse of other illegal drugs and prescription medications can have dire consequences, which we should seek to mitigate by enacting all-inclusive Good Samaritan Policies. The primary intention of a Good Samaritan Policy isn’t to reward those who make the decision to call for help when a friend is in trouble. Rather, the policy enables and empowers students to make that decision when they would otherwise hesitate. It is a preemptive policy that promotes responsible behavior rather than a reactive policy that rewards responsible behavior after the fact. Good Samaritan Policies are only effective if they guarantee amnesty in writing (usually in the student code of conduct) and the policy is widely publicized. If a school has the unwritten practice of excusing students from punitive consequences during emergency situations, but students don’t know about it, then it is like having no such policy at all. In 2008, drug overdoses caused 36,450 deaths in the United States. Drug overdose is now second only to motor vehicle crashes among the leading causes of unintentional injury deaths. Centers for Disease Control. (2011). Vital Signs: Overdoses of Prescription Opioid Pain Relievers – United States, 1999-2008. Morbidity and Mortality Weekly Report, 60, 1487-1492. Rates of hospitalizations for alcohol overdoses, drug overdoses, and their combination all increased from 1999 to 2008 among 18- to 24-year-olds. More specifically, hospitalization rates for alcohol overdoses alone increased 25%, reaching 29,412 cases in 2008. Hospitalization rates for drug overdoses alone increased 55% (totaling 113,907 cases in 2008) and hospitalization rates for combined alcohol and drug overdoses increased 76% (with 29,202 cases in 2008). White, A. M., Hingson, R. W., Pan, I., & Yi, H. (2011). Hospitalizations for Alcohol and Drug Overdoses in Young Adults Ages 18-24 in the United States, 1999-2008: Results from the Nationwide Inpatient Sample. Journal of Studies on Alcohol and Drugs, 72, 774–786. When someone in America overdoses, a call for help occurs less than 50% of the time. Tobin, K. E., Davey, M. A., & Latkin, C. A. (2005). Calling Emergency Medical Services During Drug Overdose: An Examination of Individual, Social, and Setting Correlates. Addiction, 100(3), 397-404; Baca, C. T., & Grant, K. J. (2007). What Heroin Users Tell Us About Overdose. Journal of Addictive Diseases, 26(4), 63-68; Sherman, S. G., Gann, D. S., Scott, G., et al. (2008). A Qualitative Study of Overdose Responses Among Chicago IDUs. Harm Reduction Journal, 5(1), 2; Smart, A. T. & Porucznik, C. (n. d.). Drug Overdose Prevention and Education Study. Retrieved from http://www.dsamh.utah.gov/docs/dope_u_of_uschool_20060621.pdf; Tracy, M., Piper, T. M., Ompad, D., et al. (2005). Circumstances of Witnessed Drug Overdose in New York City: Implications for Intervention. Drug and Alcohol Dependence, 79, 181-190. Fear of police involvement is the most common reason for not calling 911 during an overdose. Seal, K. H., Downing, M., Kral, A. H., et al. (2003). Attitudes about prescribing take-home naloxone to injection drug users for the management of heroin overdose: A survey of street-recruited injectors in the San Francisco Bay Area. Journal of Urban Health, 80(2), 291-301; Tracy, M., Piper, T. M., Ompad, D., et al. (2005). Circumstances of witnessed drug overdose in New York City: Implications for intervention. Drug and Alcohol Dependence, 79, 181-190; Baca, C. T., & Grant, K. J. (2007). What heroin users tell us about overdose. Journal of Addictive Diseases, 26(4), 63-68; Sherman, S. G., Gann, D. S., Scott, G., et al. (2008). A qualitative study of overdose responses among Chicago IDUs. Harm Reduction Journal, 5(1), 2. Students who are aware that a medical amnesty policy is in effect are 2.5 times more likely than students who expect to face disciplinary actions to call for help when witnessing the signs of alcohol poisoning. Oster-Aaland, L., Thompson, K., & Eighmy, M. (2011). The Impact of an Online Educational Video and a Medical Amnesty Policy on College Students’ Intentions to Seek Help in the Presence of Alcohol Poisoning Symptoms. Journal of Student Affairs Research and Practice, 48(2), 147-164. After Cornell University implemented a Medical Amnesty Protocol, students were less likely to report fear of getting an intoxicated student in trouble as a barrier to calling for help and alcohol-related calls for assistance to emergency medical services increased. Lewis, D. K. & Marchell, T. C. (2006). Safety First: A Medical Amnesty Approach to Alcohol Poisoning at a U.S. University. International Journal of Drug Policy, 17, 329-338. A survey of 355 opiate users found that once they became aware of Washington’s Good Samaritan law, 88% indicated that they were more likely to call 911 during future overdoses. Banta-Green, C. J., Kuszler, P. C., Coffin, P. O., Schoeppe, J. A. (2011). Washington’s 911 Good Samaritan Drug Overdose Law – Initial Evaluation Results. Alcohol & Drug Abuse Institute, University of Washington. Available at http://adai.uw.edu/pubs/infobriefs/ADAI-IB-2011-05.pdf. With Republican Sponsors for HB 296, Are the Political Winds Changing? Interestingly, HB 296 is sponsored by Representatives Bryan Spencer (Republican, 63) and Mike Kelley (Republican, 126). Hopefully this session will allow their bill to advance to committee and perhaps beyond. Interested parties should contact their Missouri representative to express support for this legislation. If you are interested in organizing further on drug policy issues in Missouri, follow Missourians for Drug Policy Reform.